Over Labor Day weekend 2017, we took a road trip to The Edge of Alaska, aka McCarthy, Alaska. 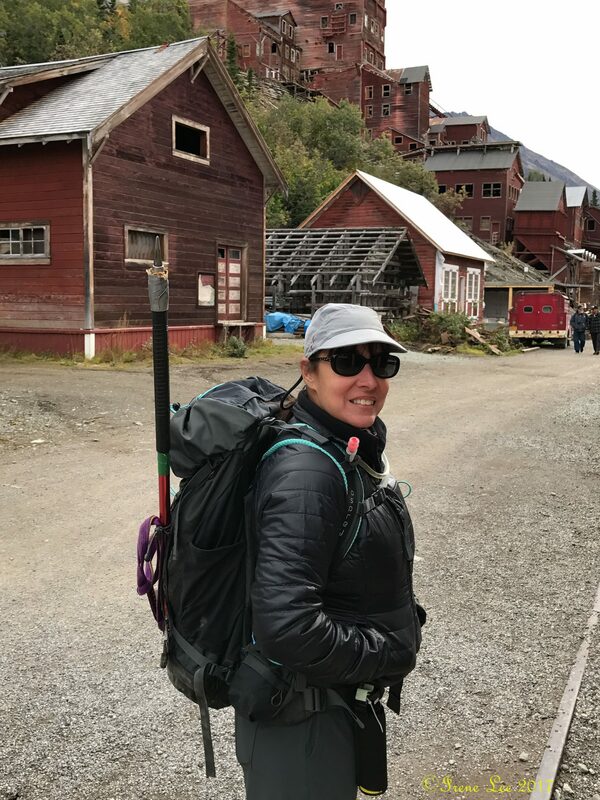 This post covers how to get there, where to stay, visiting the Kennicott Mine, and the hike to the Root Glacier and the ice caves. The drive to McCarthy isn’t your run-of-the-mill road trip. It’s a 7-8 hour drive from Anchorage, with the last 60 miles (between Chitina and the Kennicott River) on a historic gravel road. Not all rental vehicles are allowed on the McCarthy road, so check with your rental agency before you travel. Head North on the Glenn Highway until you get to Glennallen. Turn left at the junction with the Richardson Highway. About 25 minutes down the road you will come to the turnoff for the Edgerton Highway. This will eventually end in Chitina and becomes the McCarthy cutoff road. You can’t get lost. There is no other road to take at this point. Driving the entire length of the McCarthy Road can take about 2 to 3 hours one-way. The 60 mile, narrow, one lane road is gravel, winding, and depending on conditions, can be rough at times. The speed limit is 35 mph and slower around the blind, narrow curves. Fill up your tank in Glennallen or Chitina as there are NO services until you reach McCarthy. Make sure you have the ability to change a tire or fix a flat. The road can be rutted and muddy depending on the weather. Some sections are very narrow and you may have to stop to let oncoming vehicles pass. The road was built over the old railroad bed and on occasion rail road spikes have been known to eat a tire. Cell phone access is very spotty. GCI doesn’t cover this area and I think only Verizon may have some limited coverage in McCarthy. This is a very remote area and while the drive is not dangerous, don’t expect to be able to call for help. You will most likely end up waiting for some passing car to offer you ride to McCarthy or back to Chitina where you can find a tire repair service. You will drive over the famous Copper River where you will see many fish wheels and fisherman dip netting for Copper River Salmon. At Mile 50.2 of McCarthy Road, is the one-lane, 525 foot long Kuskulana River Bridge. It sits at 238 feet above the bottom of a gorge and has long been known as “the biggest thrill on the road to McCarthy.” The very short video below shows us driving across it but definitely doesn’t do it justice. As you get closer to McCarthy the road becomes narrower and you get some beautiful views of the St. Elias Mountain range directly in front of you. The Wrangell Mountains to your left, and the Chugach Range to the right. There is a campground about 1/4 mile before the end of the road (which is where the McCarthy footbridge can be seen). It is called Glacier View Campground and I highly recommend it. This is where we stayed and the camp sites are wooded with picnic tables and a fire pit. It costs $15 per night for tent camping (as of 2017). There is also a vaulted outhouse and very rustic shower ($10). The campground also has a small restaurant if you don’t feel like making the walk back to McCarthy or cooking for yourself. The owner is an Alaskan who lived in McCarthy for many years. Very nice man. Reservations can be made via email or by telephone. RV camping is limited. Daily parking is free which is nice if you decide to stay at one of the rental cabins further back on the McCarthy Road. Please be warned. This is remote Alaska and this campground is NOT what you see in other places in the USA. It is rustic and even in late May the overnight temperatures can drop into the 30s F.
There is also a huge parking area right at the footbridge where large RV campers (and a few tents) were parked when we were there. It is called Base Camp Root Glacier and the sign indicated the cost was $20 per night. There is no privacy at this site, it is designed for RVs. Great location if you are driving an RV to McCarthy. At the end of the McCarthy Road, a footbridge takes you across the Kennicott River to McCarthy. From this bridge you have stunning, unimpeded views of Root Glacier. 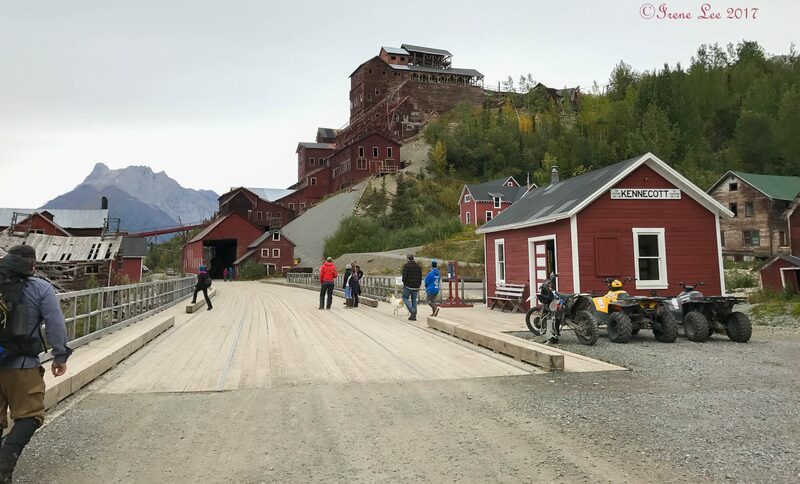 Once on the other side, there is an hourly shuttle that takes visitors to both McCarthy and Kennicott. The walk to McCarthy is short, less than ½ mile. Kennicott is another 5 miles from McCarthy. The shuttle ride to McCarthy is free. The cost is $5 per person one way, if you are going all the way to Kennicott. 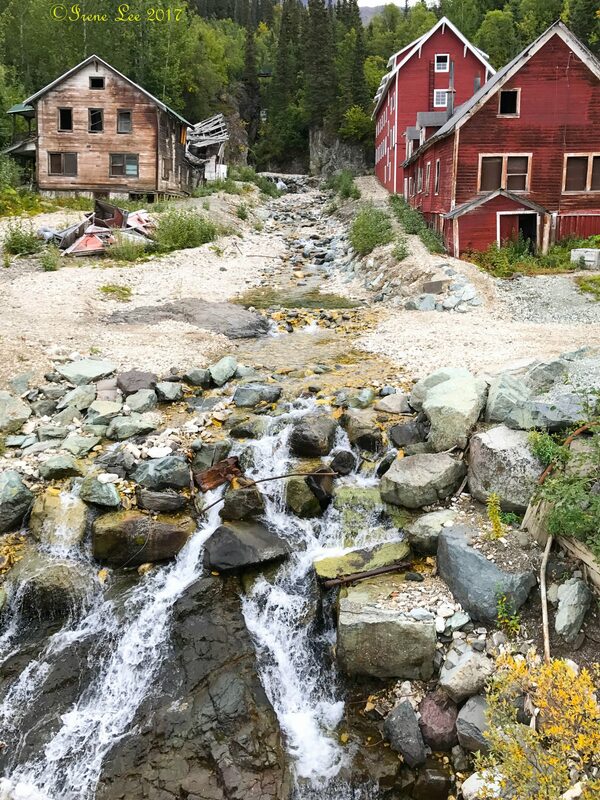 McCarthy itself is a tiny town on the foothills of The Wrangell-St. Elias National Park and Preserve. Once a rowdy pioneer town, McCarthy now makes a great base camp for adventures into America’s largest national park, Wrangell-St.Elias. Four mountain ranges converge in this remote park, the size of six Yellowstones! 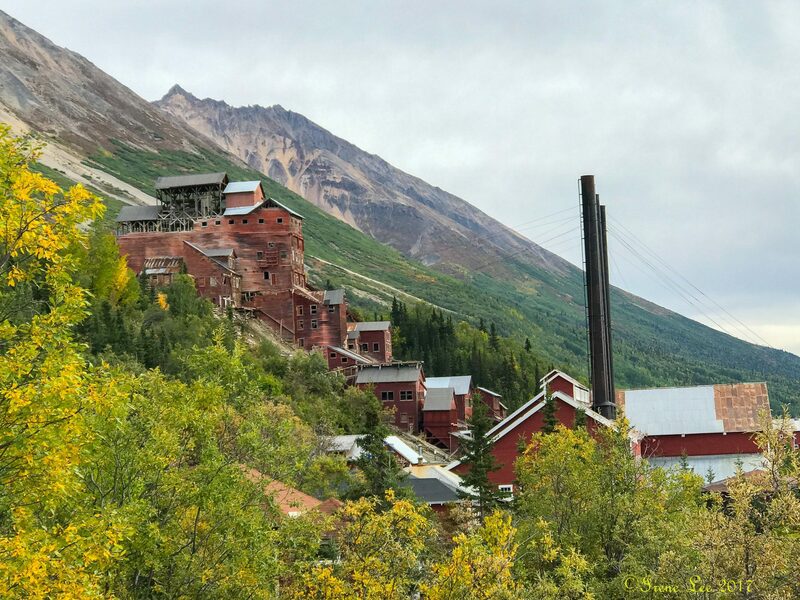 In addition to being a gateway for the Wrangell-St. Elias Mountains, McCarthy is also home to the Kennicott Mine National Historic Landmark. 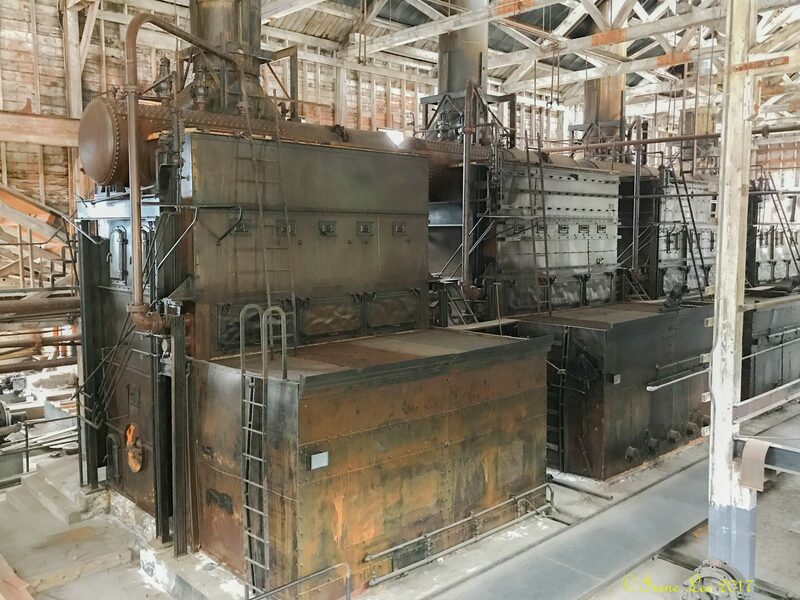 From 1911 to 1938, nearly $200 million worth of copper was processed at the mine. 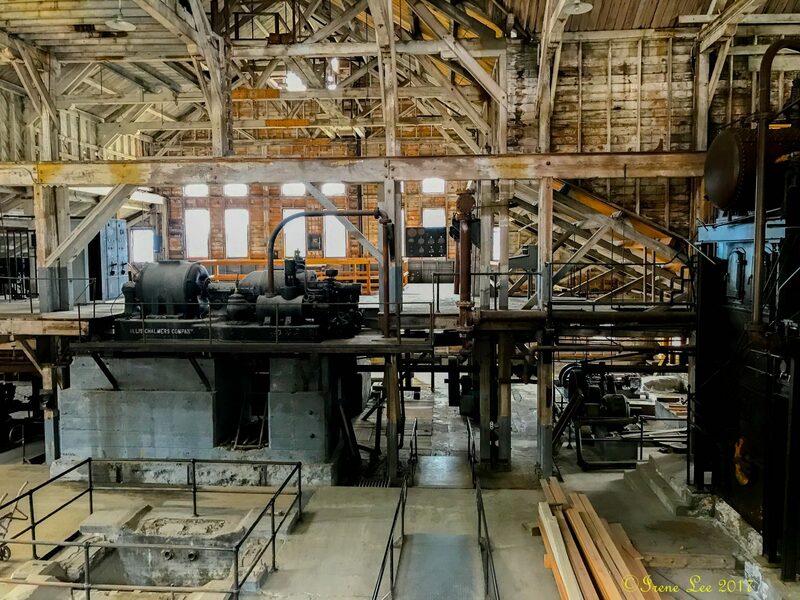 The operation had two components: The mines, where ore was extracted from the mountains, and the mill town where the ore was processed. In its heyday, Kennicott was a self contained town with a hospital, school, grocery store, skating rink, and tennis courts. 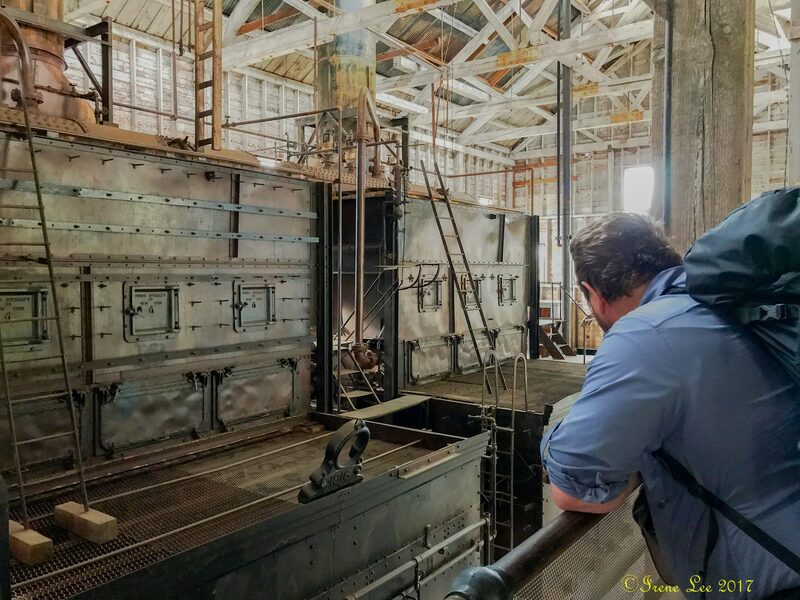 The National park Service and the community are still actively working to stabilize and reconstruct the buildings. As I stated, it is 5 miles from the town of McCarthy and you can either walk or take the shuttle. Just be aware that it stops running at 6:00 pm. 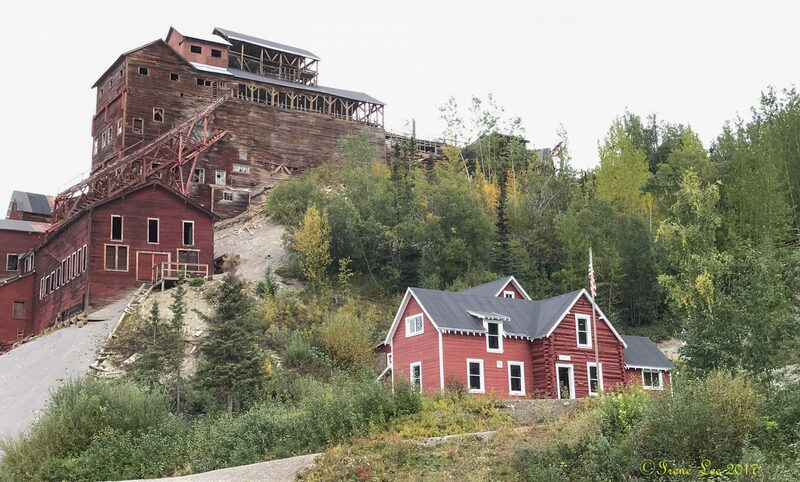 Also located in Kennicott, is the Kennicott Glacier Lodge. A nice remote lodge for those wishing to spend time in a hotel room in a remote part of Alaska. Rates start around $195/night (as of the 2018 season). 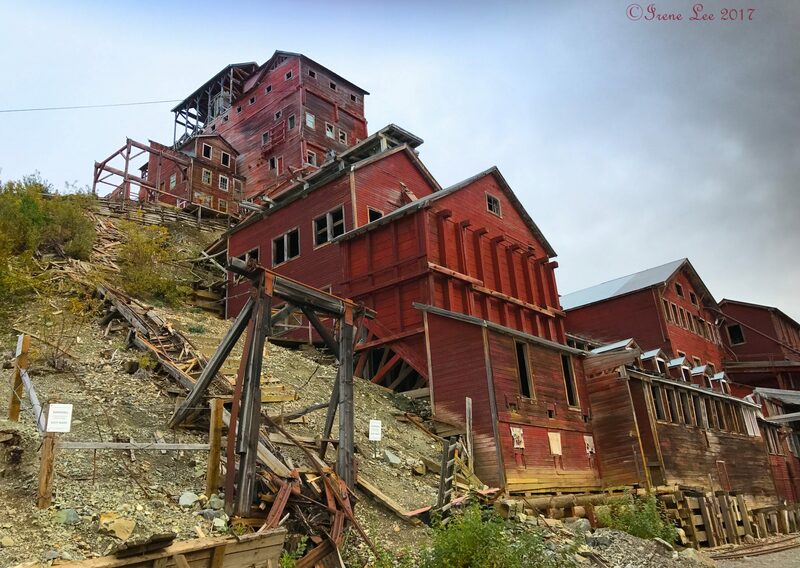 The shuttle drops you off in front of the visitors center and it’s a short walk to the Kennicott Mine buildings. 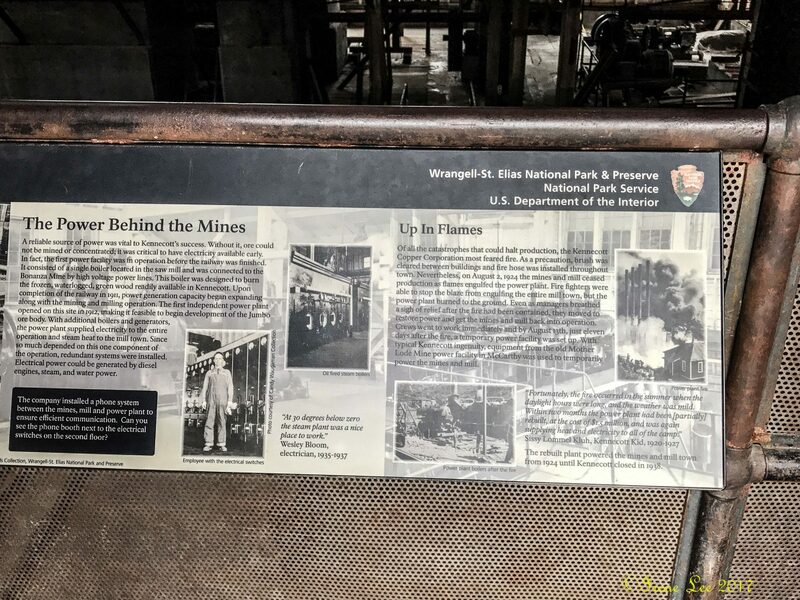 If you are planning to hike to the glacier you just keep walking along the road past the mine. You can’t get lost. There’s no other road to take. You will find an outhouse here as well as along the trail about 1 mile away. 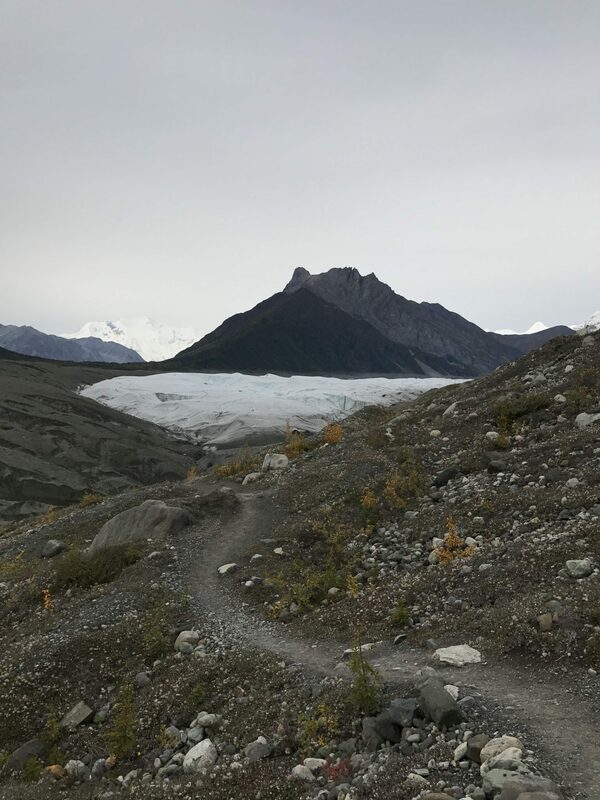 The trail is an easy, nearly flat walk through wooded areas that give you a constant view of the glacier. Do stay alert as this is grizzly country and bears are often seen in McCarthy and the surrounding areas. When you get to the first outhouse along the trail (about a 20 minute walk) the road forks. Here you keep going toward the left to the glacier, or take the trail to the right which leads to the Jumbo mine. We didn’t hike the Jumbo Mine trail but I am told it is all uphill for a couple of miles. The 2 trails are clearly marked. The trail toward the glacier continues and gently climbs as you approach Jumbo creek. A wooden plank has been placed across the creek and you walk across, one person at a time. It’s not dangerous and very short (6 ft across at most). Obviously not suitable for people in wheelchairs. Bikers will have to walk their bikes across. Shortly after crossing Jumbo Creek you will come to a small area where you can set up a tent. There are bear proof containers to store your food a short walk away. This is a small campsite, not suitable for large groups. Another 10 minute walk down the trail you will come to another fork in the road. The sign will tell you to go left for the glacier trail. If you keep going straight you will come to another outhouse about 1 minute down the trail. This one requires that you climb up some primitive rock and wooden stairs. This is a good place for a bathroom stop before heading out on the glacier. Do not throw paper into this outhouse! You are required to pack out your trash and this includes toilet paper. When you are ready, go back down the stair and back track to the glacier trail sign and start the descent down. The descent is a little steep but not difficult. If it’s been raining or it’s muddy, hiking poles can be very beneficial. The descent is short and you’ll be on level ground again in about 10 minutes max. From here you can clearly see the glacier and where the trail leads you onto it. There is also a large, flat are to the left that is great for setting up multiple tents. It’s not wooded and there is no privacy, but it has a great view. From here, the walk to the glacier is about 10 minutes away. 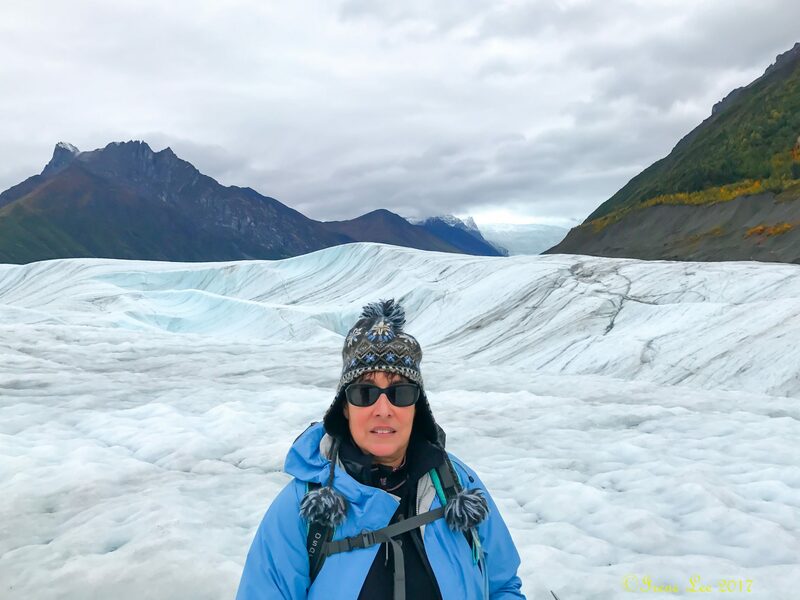 Once you arrive at the toe of the glacier (black sandy hill) you can sit on the ground or on one of the big rocks and put on your crampons and any warm gear you might think you’ll need. I only added a hat, light gloves, and a fleece jacket. I was already only wearing hiking pants and a t-shirt. We went over Labor day weekend and the weather was a little drizzly and about 54 F degrees. it was a very warm hike to the glacier. Rain pants are a good idea if it’s raining as it may get cold once you are on the glacier. Once you have your crampons on, just start walking up the toe of the glacier (very easy) and onto the glacier. It’s pretty safe with no open crevasses for the first few miles. I just advise that you stay away from the steep edges. If you slip, you will slide right off and that could potentially ruin your day or end your life. After you’ve been walking for about 5 minutes, stop and look back to where you came from. Familiarize yourself with the terrain so that on your return trip you don’t get confused as to where the exit point is located. It’s easy to start walking and forget which side you came up on. 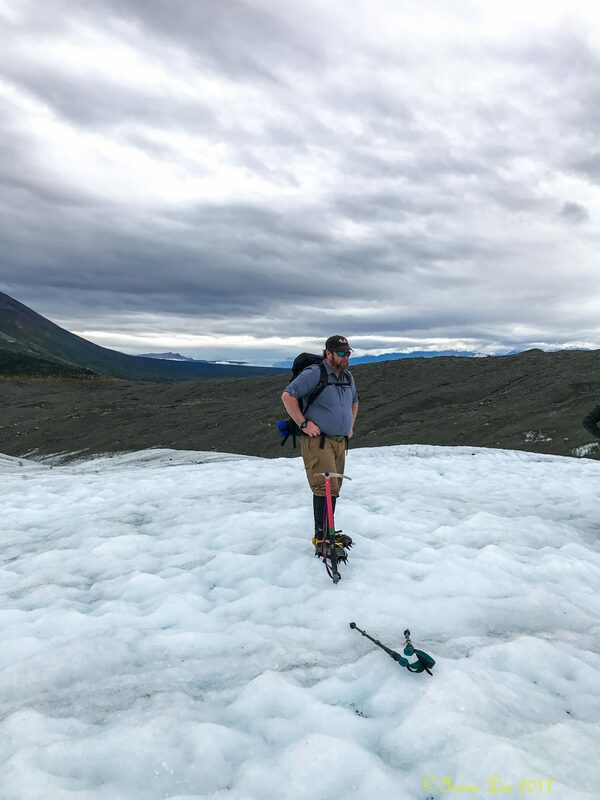 Your level of comfort walking on a glacier, how much time you have before needing to catch the shuttle back, and how cold you are, will dictate how far you can walk on the glacier. 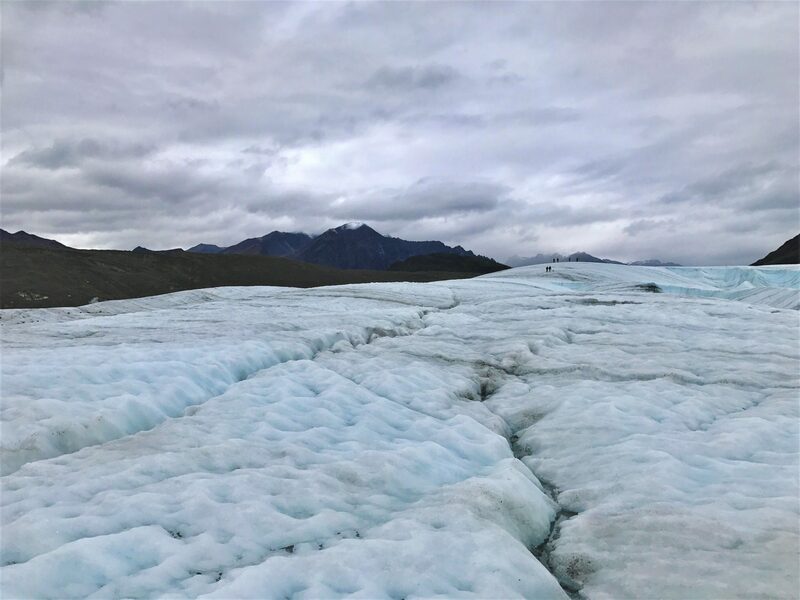 A rough estimate is that you can go about 4 miles before encountering technical skill level ice that would require ropes and advanced glacier skills. On your return, walk down the moraine and take off your crampons. walk about a minute or so back along the trail and look to your right. All along the edge of the glacier is where the ice caves might be found. However, you won’t know until you walk across the rubble field and starting looking. The one we found was very obvious. The opening was easily seen and the walk to it was relatively easy. We left our backpacks outside because this particular cave was very low and it was easier to crouch into it without the packs. Be very careful to look at the cave before entering. Look for falling rocks, unstable ceiling, etc. In general, it’s safe to enter these caves but be very aware that they can, and do collapse. They aren’t always in the same place because of the constant moving of the glacier and the collapsing of the caves. Each year you might find the same cave in the same spot-or not. A new one may have formed over the winter. If you have any questions about The McCarthy Road, where to camp, or the hike out to the glacier, please leave your questions below. I normally respond the same day. I believe you turn right in Glennallen and head south on the Richardson to get to the Edgerton cutoff. Otherwise, glad to hear in had a good time in some of my stomping grounds! Great photos! Yes, good catch. I will correct it right now. Thanks for letting me know!